Eighteenth-century abolitionists used every propaganda tool in the book, but one of their most widely circulated visual aids was an innovative diagram of the Liverpool slave ship Brookes (above), first published in 1788. Thanks to a parliamentary survey that year, detailed measurements of the Brookes were available and a group of Plymouth-based campaigners had accurate deck plans, cross-sections and side views drawn up. Into these were added hundreds of prone black figures, not dissimilar to Isotype figures (Otto Neurath had a German reproduction of the diagram, dated around 1800, in his private collection), drawn to the dimensions laid down in the Regulated Slave Trade Act of 1788 (‘6ft by 1ft 4in to each man, 5ft 10in by 1ft 4in to each woman, 5ft by 1 ft 2in to each boy, 4ft 6in by 1ft for a girl’). 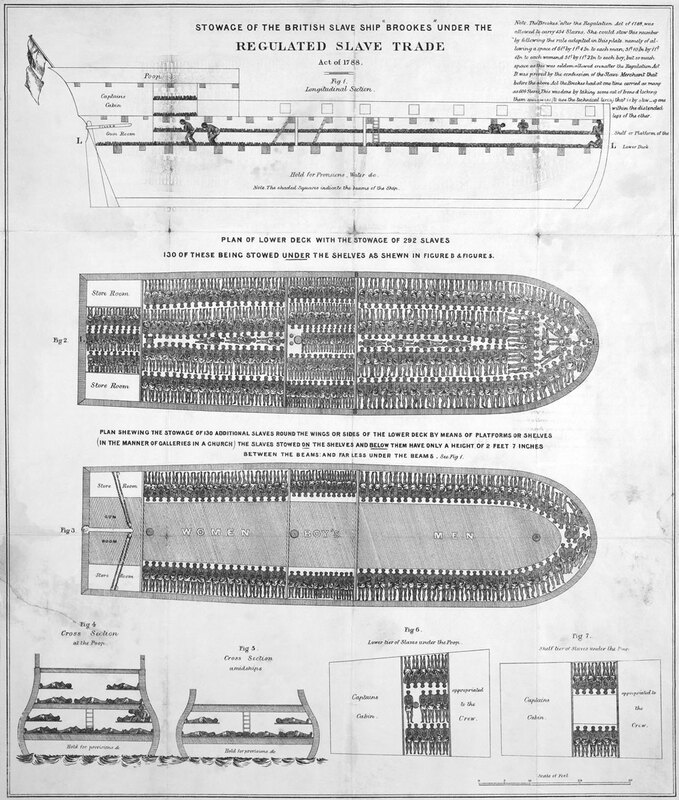 Under the act, which was designed to reduce the overcrowding that led to so many deaths on the transatlantic crossing, the Brookes was permitted to carry a maximum of 454 slaves. The engraver managed to fit 400 in. At least one earlier voyage had carried a human cargo of 609 African people. London abolitionists had it printed on 7000 posters (in one run), and, in the years that followed, the diagram was widely copied in broadsheets, pamphlets and books in Britain, France and America. ‘No one saw it but he was impressed,’ wrote the tireless abolitionist Thomas Clarkson, who was partly responsible for the original. ‘It spoke to him in a language which was at once intelligible and irresistible.’ Art critic Tom Lubbock described it as ‘perhaps the most politically influential picture ever made’. Despite its undoubted power – the diagram moved people to tears as early as 1789 – Wilberforce’s act abolishing ‘the purchase, sale, barter or transfer of persons intended to be … used as slaves’ throughout the British empire was not passed until 1807. Slavery itself was not banned until 1833. Image: Library of Congress / Science Photo Library.